1966 Gordon Woods Nat Young's Sam 9 ft 4"
Foam blank with 1/2" redwood stringer, glassed in Volan with 2" rail lap. Bottom: Flat nose. Rounded bottom, deepest in front of the fin. during Nat's pre-contest practise sessions. 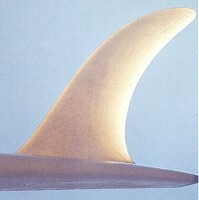 George Greenough's Stage III fin for Danny Hazzard, circa 1967. 1. Nat Young and Sam, first surf. n/a denotes dimensions or feature details not available. Board images were digitally constructed from #36. Clear with ½” redwood stringer. Volan glassed with wide rail lap by Darryl Holmes. First ridden at The Kick, Collaroy. See photograph above. 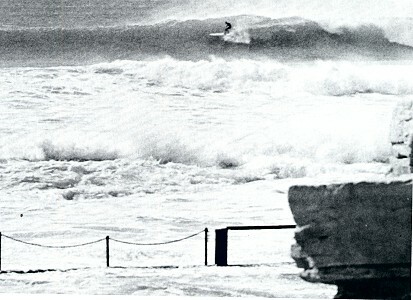 The fin was further tuned by George Greenough in Santa Barbara during Nat's pre-contest practise sessions. 1966 World Championship (San Diego, California) winning board..
Competition Day One saw Corky Carroll place first. However by the end of the second round, Nat Young not only placed first for the day, but had accumulated enough points to be outright champion without competing further. An emphatic performance, probably unequalled in contest surfing history, ermphasised by victory in foreign waters and the early elimination of the American favourite, David Nuiihwa. To maintain interest in the contest,Young offered to disregard the previous results, but this was unacceptable to the officials. Competition was continued with Nat Young again topping the score sheets. Other finalists were, in order, Jock Sutherland (Hawaii), Corky Carroll (USA), Midget Farrelly (Australia), Rodney Sumpter (UK) and Steve Bigler (USA). 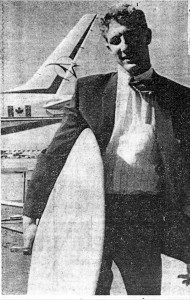 Despite competing for the U.K (his place of birth), Rodney Sumpter learnt his surfing skills on the northern Sydney beaches in the early 1960's. This was not the frst, or last, time he competed against Nat Young and Midget Farrelly. Sam disappeared during the post contest celebrations. Cabell really impressed some with his opposite approach. His thing was to stuff himself into (the) curl at every opportunity, foresaking almost anything to do it, then dress up the situation with a noseride if possible. up to hold i.t back in there as long as he could. This approach captured the imagination of those that had the nice waves to work on, so up at Noosa it got going, with (Bob) Cooper, Russell Hughes, Algie Grud, myself, Kevin Platt, making the boards to suit at Hayden's (Surfboards). forerunner. The Hayden boards soon took on in Sydney, Brian Morris and Bondi guys took to them. 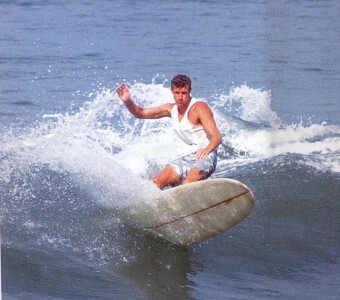 states often bought or thought their boards from there. Initially derived from a Joey Cabell design, it developed at the Noosa sessions late 1965 with George Greenough, Bob McTavish, Russell Hughes and Bob Cooper, based at Hayden Surfboards, and subsequently Cord Surfboards, Alexandria Headlands. 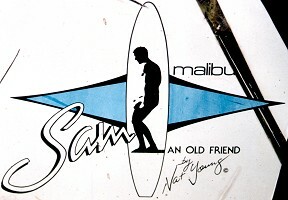 Not to be confused with a mid-1980's Modern Malibu design by Nat Young featured a Sam - an old friend decal, manufactured by Mike Davis Surfboards, Kiama and others.See below. COMMENTS: Typical example of this design, vitrually the Last of the Malibu's (for the 1960's). Includes commentary on Nat Young's performance at the Makhaha Championships,1966. Pages 126 - 127. Nat’s Nat Pages 110 - 145 Text and photographs. Edited version of John Witzig's We're Tops Now article from Volume 8 Number 2. Image 5 : Ron Stoner, page 24. Volume 4 Number 1, April - May 1966, pages 26 - 35. Volume 2 Number 2, Autumn 1999, pages 68 - 121. Image 3 Photograph by George Greenough, Page 95. Paul Wizig : Hot Generation, 1967. Although the film does not contain footage of Nat Young and Sam, a photograph by Ron Stoner (Image 5, below) was used on the poster. 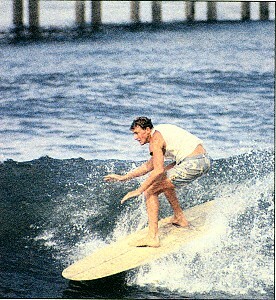 It also was a cover shot for Surfer magazine (Volume 8 Number 1?). 5. Cut back, World contest, 1966.